How is Israel weathering the global economic storm? People often ask me, how is Israel weathering the global economic storm? Well, according to Bank of Israel head Stanley Fischer in an interview in today’s Haaretz, the recession in Israel is officially over. That doesn’t mean that things will improve overnight. Unemployment generally lags behind increases in spending, as it takes time for companies to gear back up after months of sustained layoffs. How did Israel pull out so quickly? In part, because we didn’t have a sub-prime mortgage crisis. I used to bemoan the fact that we couldn’t put 5-10% down and own a house. In Israel, 60% down was the rule. But that seems downright smart these days. We also didn’t have any banks fail during the crisis. BOI chief Fischer bought millions of U.S. dollars – what’s known as an expansionary monetary policy – which shored up the shekel to dollar exchange rate in favor of Israeli exporters. 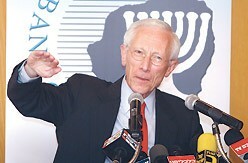 Fischer expects that today’s NIS 3.7 to the dollar will go up soon. Posted in In the News, Israel, Saving Money.